This is a serious bacterial infection that affects the mucous membranes of one's nose and throat. It usually causes a sore throat, fever, weakness, and swollen glands. The infection causes a grey to a black, fiber-like covering which can block one's airways making it difficult to breathe. 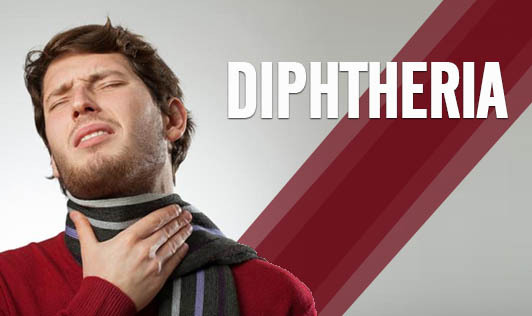 In some cases, diphtheria can affect the skin and cause skin lesions. However, in advanced stages, diphtheria can cause damage to the heart, kidneys and nervous system. When the bacteria affect the mucous membrane of the throat and nose, the below common signs and symptoms begin to appear two to five days after the person becomes infected. Note: There may be no symptoms. Infected people who remain unaware of their illness are known carriers of Diphtheria because they can spread the infection without being sick themselves. See your doctor if you're not sure whether you or your child has been vaccinated against Diphtheria!